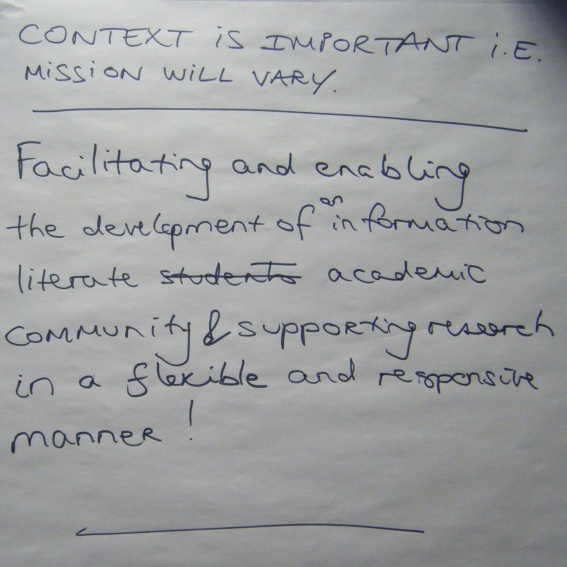 On Wednesday the 17th March, I and several colleagues from Leicester visited the Pilkington Library, Loughborough University, for the EMALink event Subject Librarians…defining their mission, measuring their impact, preparing for the future. Subject Librarians are feeling a little uneasy about their job security these days. This is due to events such as those at Bangor University, where several subject librarians lost their jobs, and the more recent events at Warwick University, where subject librarians had to re-apply for their jobs at a lower grade. So, the aim of this event was to look at what we do and how we can show our worth. “The Impact of Subject Librarians on their academic communities” by Lizzie Gadd, Loughborough University. Loughborough did a survey of academics in the Departments of Civil & Building Engineering, English & Drama, and Materials Engineering to assess the impact subject librarians have on their communities. They got a 27% return rate and felt that they were probably preaching to the converted, as the respondents were generally those already known to library staff. 25 out of 29 respondents knew they had a subject librarian and 22 could name their subject librarian. What was interesting was the difference in how academics rated the skills they thought subject libs should have, compared with how subject libs themselves rated the same skills. Subject knowledge (not just information resources knowledge) was rated highly by academics, as was the ability to keep up to date, whereas subject libs rated subject knowledge high but not as high and thought presentation skills were pretty important. When asked which services subject libs should be able to help with the academics rated the top three as copyright advice, putting content into the institutional repository and finding journal impact factors. Copyright came as a surprise as the University has a copyright officer who is not based in the library. What also surprised the subject libs was the glowing testimonials that accompanied the surveys,a nd which they hope to use in marketing their services at a later date. Comments such as “Invaluable”, “Important” and “Skilled Professionals”. They tried to do some social network analysis based on the responses (i.e. how the academics and subject libs were related, who knew who etc), but the sample was too small. They hope to further the research with a new bid for funding and would look at widening the survey to non-users, measure departmental use of the library management system and analyse subject libs communications with academics. From the findings of this initial survey they are looking at the issue of offering copyright advice, offering research impact training to Depts (which has raised the usage of JCR), and marketing the subject libs better to the academics. “What are we here for? 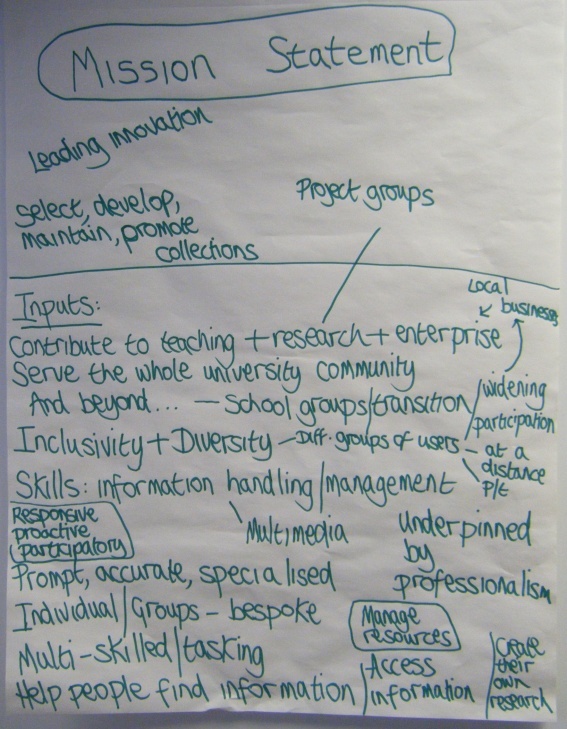 Developing a mission statement for Subject Librarians” facilitated by Chris Martindale, Derby University. Chris did a short introduction to this session musing on what is a subject librarian? Are we there to improve services? As experts in our field? As a gateway to collections? Are we endangered? Should we have functional skills or subject skills? Do we suffer from poor job definitions (Pinfield, S, 2001)? We should be positive in response to change/challenges. What do we do? are we moving into new roles? Do we need new ways of working (Roberts & Levy, 2005)? How do we demonstrate value? We then split into groups to try to write a subject librarian mission statement (see photos). Our group got distracted by talking about the differences in what we did, whether we taught and how we supported research. One of the things we identified with in Chris’ talk was being compared to “middleware”, as we sat between the library and the department, and had to represent the views both to each other. We then broke for a speed-dating lunch, but I was too busy chatting to people to do any speed-dating! This entry was posted on 25 March, 2010 at 11:14 am	and is filed under Meetings, Service Delivery, Subject Support, Wider profession. Tagged: event, future, impact, librarians, subject librarians. You can follow any responses to this entry through the RSS 2.0 feed. You can leave a response, or trackback from your own site.